STOP at the TOP. Dive in. Breathe free. Enjoy. Skiing from morning to night in one of the world’s 10 most attractive skiing holiday destinations. 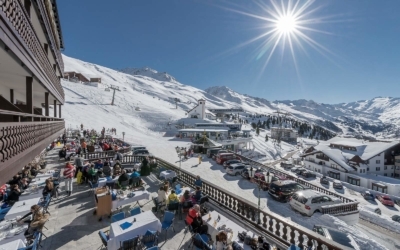 Ski-in & ski-out at 2,150m above sea level in one of the Alps’ highest ski resorts. 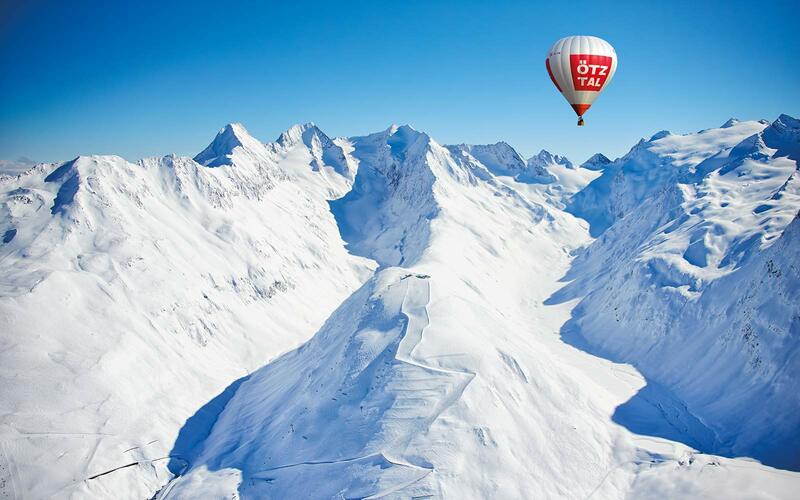 Arrive at the summit of delight – surrounded by the Ötztal Alps’ 21 glaciated three-thousanders. Get carving! 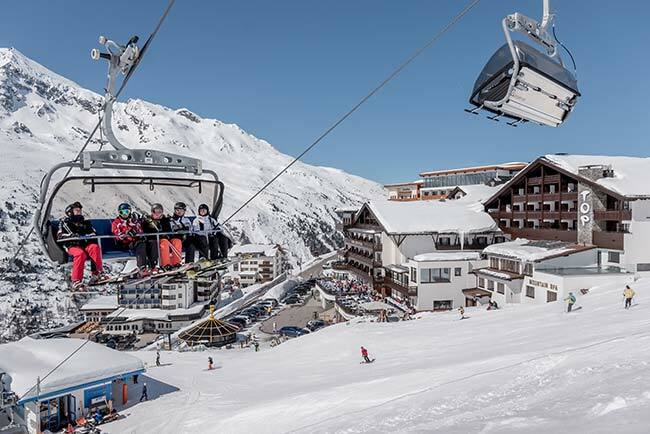 On the Obergurgl-Hochgurgl ski area’s longest downhill run – on the TOP Hotel Hochgurgl’s doorstep. 110km of perfectly groomed slopes at up to 3,080m above sea level. Trade November’s rain for ski magic. Corn snow in spring sunshine. The ski area’s altitude ensures fun on the slopes with guaranteed snow from November to May. 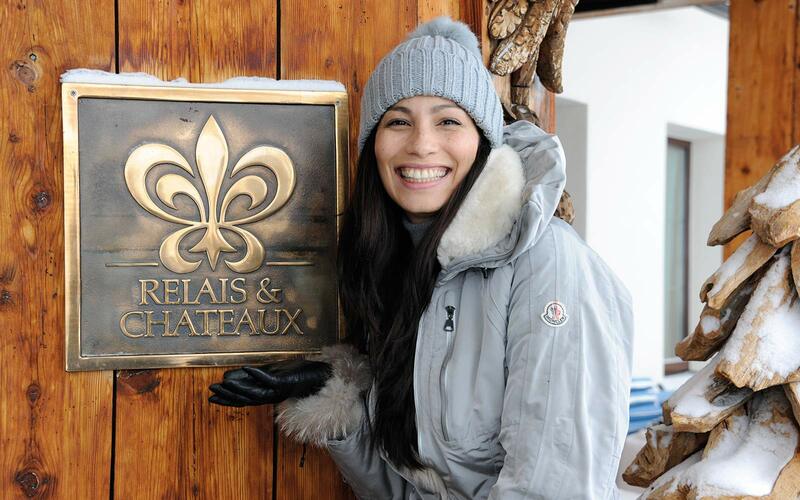 The luxury hotel’s charm reflects dignified tradition, Alpine flair and cutting-edge hospitality at the Relais & Châteaux 5-star superior hotel. Relax and dream in our romantic, rustic or modern rooms, apartments and suites. 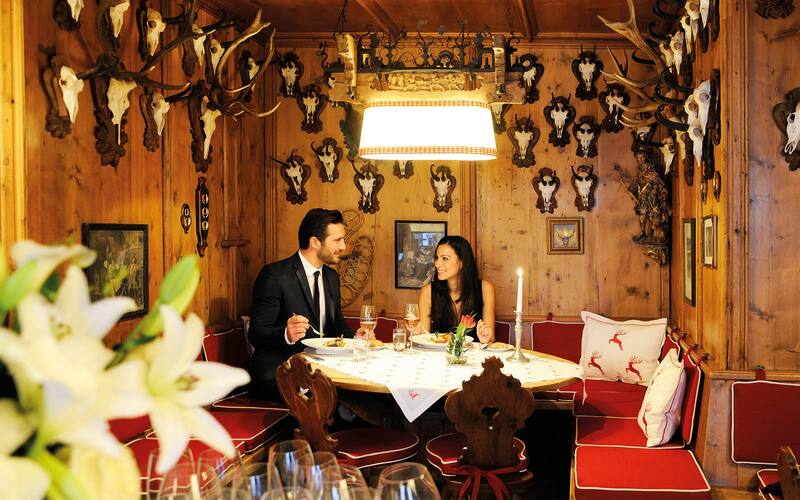 Enjoy gourmet cuisine, sweet temptations from the hotel’s own patisserie and rare wines from one of the Alps’ highest wine cellars in the restaurant, in one of the rustic Tyrolean Stuben, on the sun terrace, at the oyster bar or in the fireplace bar. Experience endless opportunities for relaxing in the wellness hotel’s TOP Mountain SPA with 360° views of the Ötztal mountains from the heated outdoor pool, an indoor pool, sauna area, superb treatments, anti-ageing cosmetics and a fitness centre. Romantic, playful, rustic or modern, the 5-star superior hotel’s sleeping, dreaming and wellbeing spaces are as individual as you are. 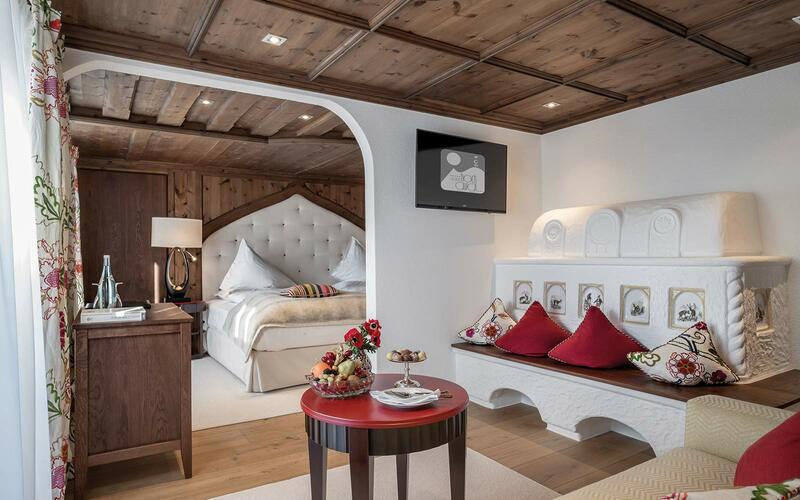 From the welcome fruit plate in your room to free Wi-Fi and the pillow menu to the turndown service, the Relais & Châteaux TOP Hotel Hochgurgl leaves nothing to chance. High quality accessories and toiletries by Bvlgari await in your marble or luxury bathroom, as do fluffy bathrobes and towelling slippers – ready for your visits to the TOP Mountain SPA. Listen to the crackle of the open fire or savour the warmth of the tiled stove. 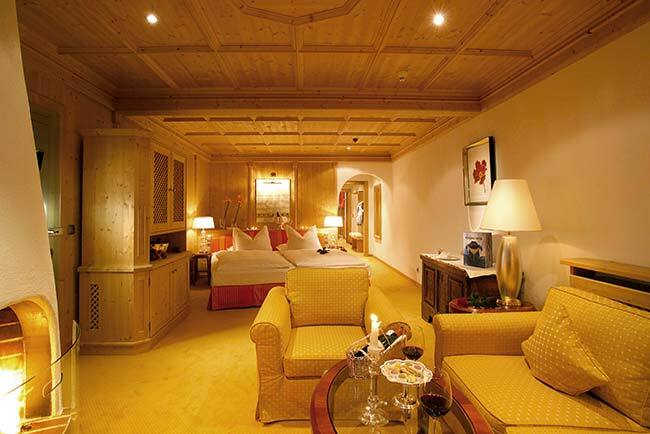 Admire the snowy view, all the way to the highest peaks of the Ötztal Alps through the picture windows or from your south-west-facing balcony. Pure comfort, natural rusticity and stylish elegance for the discerning guest. Your TOP hotel never compromises on quality. Honest enjoyment from dawn until late made with selected local organic produce and exquisite specialities from around the world. The finest regional delicacies combine with international delights for 5-star superior cuisine. 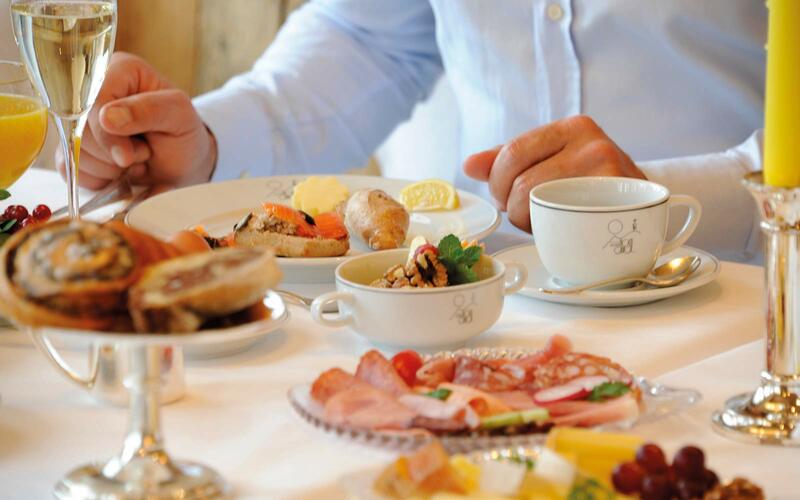 In the morning, savour the hearty breakfast buffet in the Schalfkogel and enjoy a 5-course dinner in the evening with a selection of soups, starters, main dishes and desserts. 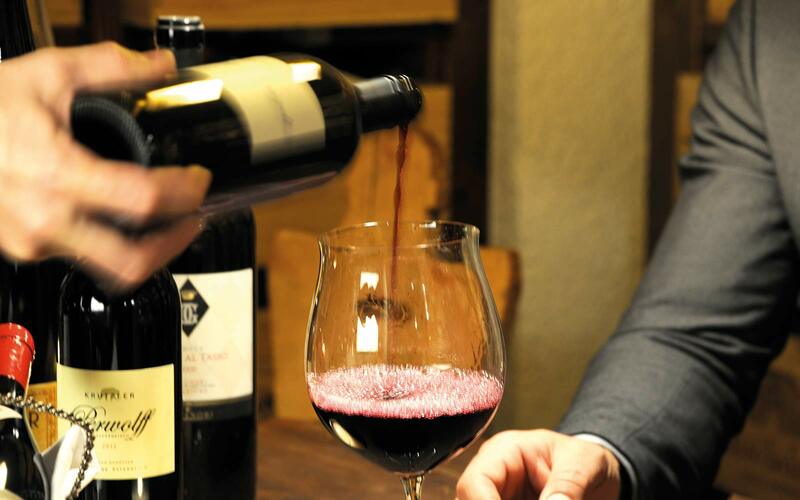 To accompany your gourmet meal, rare and fine wines are selected from 500 bins in one of the Alps’ highest wine cellars. TOP off your delights in the luxurious and welcome ambience of the restaurant or in one of the Tyrolean Stuben – with oysters, supplied fresh every day, with a selection of cheeses brought to us by Maître Fromager Günther Abt, with carved, filleted and flambéed dishes, fondue bourguignonne or chinoise, salt stone grill etc. 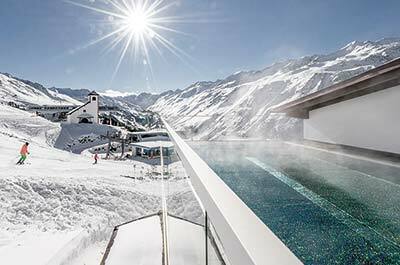 Vegetarian and vegan gourmets also love TOP Hotel Hochgurgl’s cuisine, as do discerning connoisseurs of lactose and gluten free dishes and dietetic wellness fare. Sweet temptations offered by the luxury hotel’s own patisserie are the perfect accompaniment to panoramic views in the sunshine. Doing nothing. Experiencing so much. 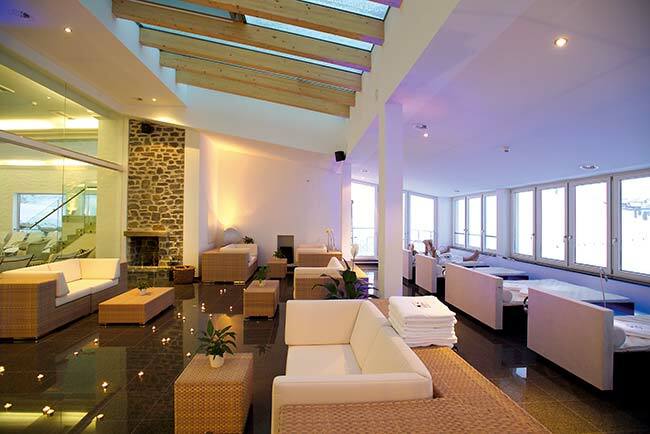 Luxury for body, mind and spirit at 2,150m above sea level: the TOP Mountain SPA. 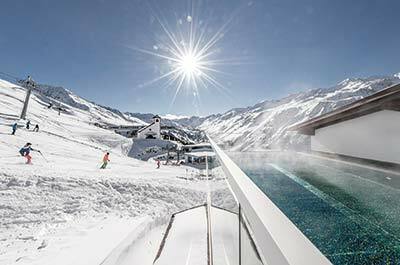 Take a deep breath and dive into the heated outdoor pool in the heart of the Obergurgl-Hochgurgl ski area. 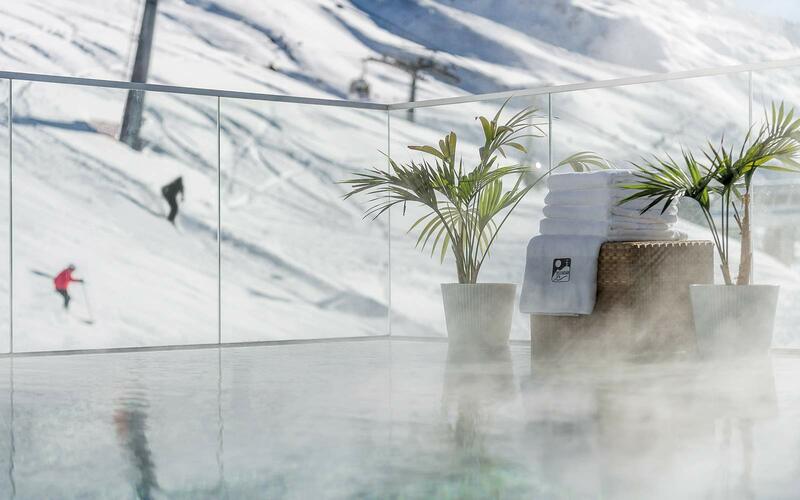 Sit back and enjoy the 360° panoramic view of the pistes at the wellness hotel. 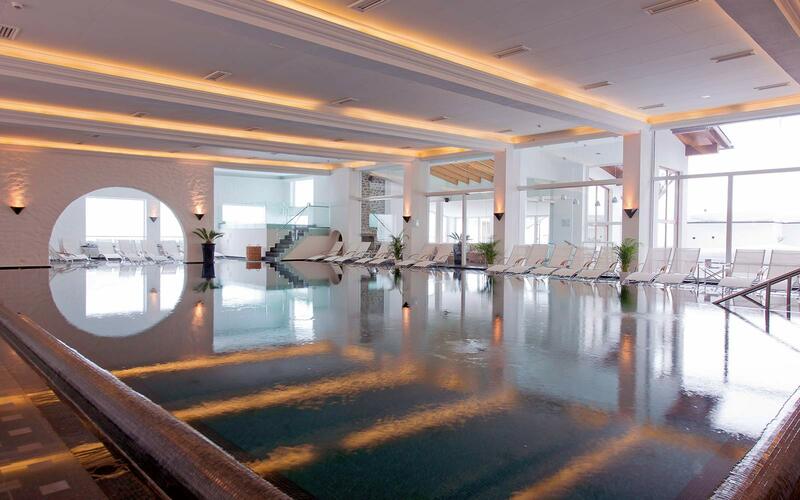 Enjoy a swim in the piste-side panoramic outdoor pool or the 10 x 18m indoor pool. Turn up the heat and enjoy the steam room, herb sauna, Finnish sauna, bio sauna, outdoor sauna and infrared cabin. Take a deep breath in the saline steam room – balm for the respiratory tract. Stay fit and healthy in the fitness area with the latest TechnoGym equipment. Unique spa and beauty treatments in the Relais & Châteaux TOP Hotel’s five treatment rooms combine the power of nature with the latest treatment methods and scientific findings. 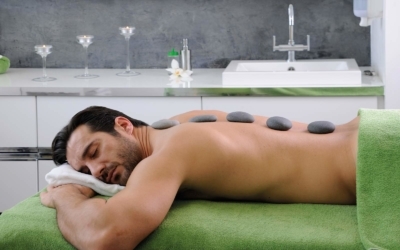 From medical anti-ageing cosmetics to body styling, permanent make-up and aesthetic cosmetics, why not book a treatment during your wellness holiday in Hochgurgl? Is getting ready for your skiing holiday stressing you out? 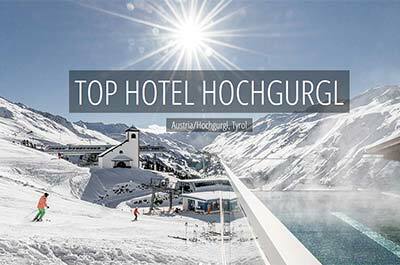 Let the TOP Hotel Hochgurgl ease the pain. Enjoy the convenience of online pre-ordering, and your equipment – from helmet to ski boots and skis – will be ready and waiting for you when you arrive. You’ll find a superbly stocked sports shop in the 5-star superior ski hotel. 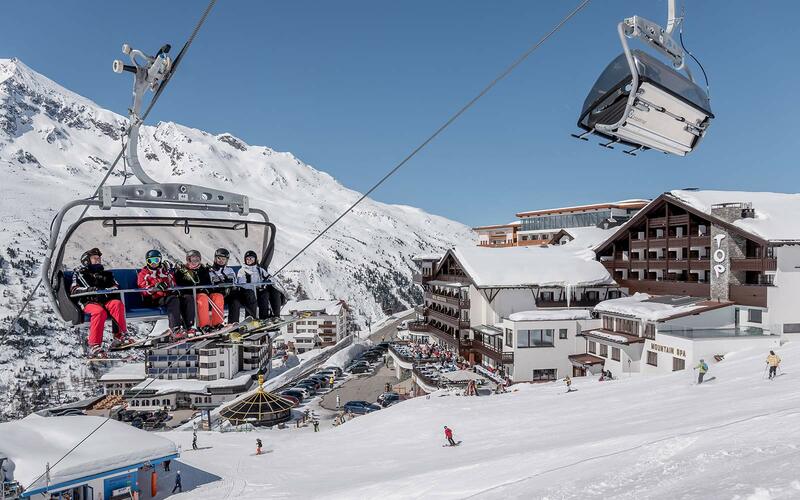 If you prefer not to bring your own ski equipment, you’ll find everything you need for your winter sports fun in the superbly stocked sports shop at the TOP Hotel Hochgurgl. 110 perfectly groomed slopes at 1,800 to 3,080m above sea level. Winter skiing holiday fun from November to May, surrounded by the Ötztal mountains’ snow-covered three-thousanders. Twice voted one of the world’s TOP ten ski resorts. 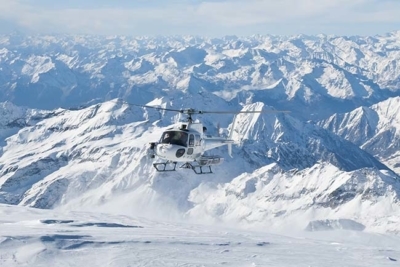 The Alps’ most snow secure ski resort and opens in November – in advance of Tyrol’s other non-glacier ski areas. 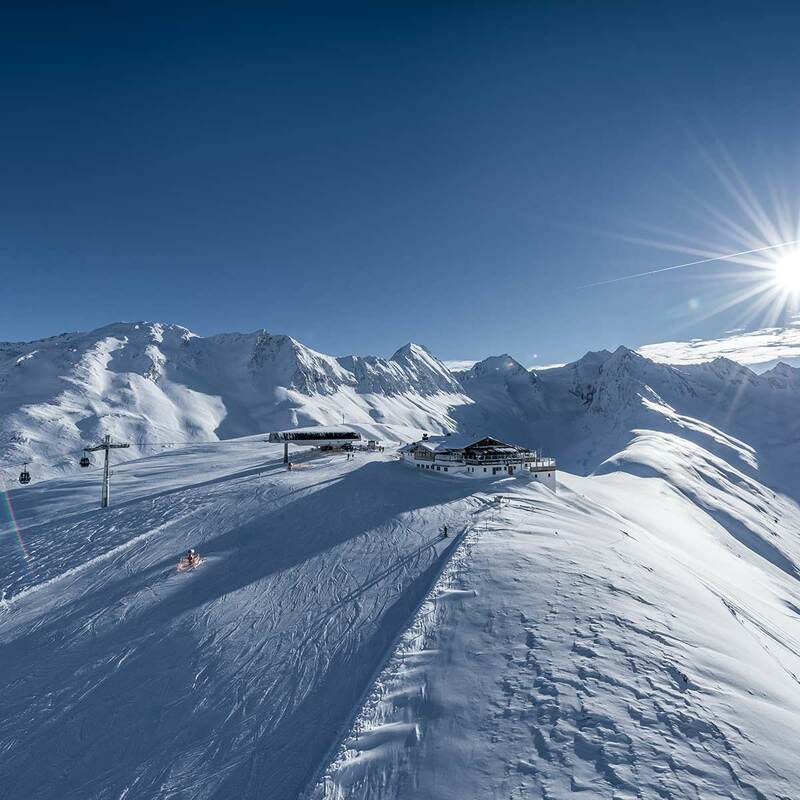 Winter wonderland for downhill skiers, carvers, freestylers, off-piste skiers and snowboarders with safe, wide pistes above the tree line for all ages and abilities. Experience the Obergurgl-Hochgurgl ski area in TOP form. 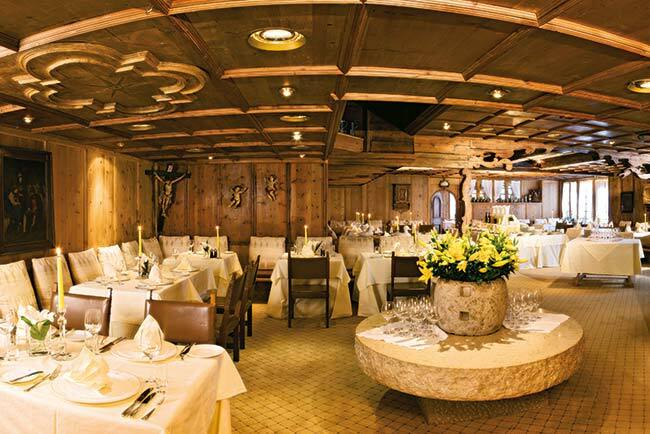 A landmark with the finest culinary offerings and 360° views at 3,080m above sea level. Enthroned on the narrow ridge of the Wurmkogel, a panoramic bar and viewing platform combine to create an architectural and gastronomic masterpiece. Tip: Also available for your own, exclusive summit party. A 6,060sqm futuristic fusion of panoramic restaurant, terrace, indoor and outdoor chill zone, motorcycle museum, toll station, lower cable car terminus and passing point between North and South Tyrol at 2,175m above sea level. The teaching at the Hochgurgl ski school is superb. Certified skiing, snowboarding, carving and cross-country skiing instructors know the region like the back of their hands. They go the extra mile to teach class skills and all the joy of winter sports to both children and adults. The qualified teaching and skiing professionals use play to introduce children to skiing – and can look after them all day long if required. 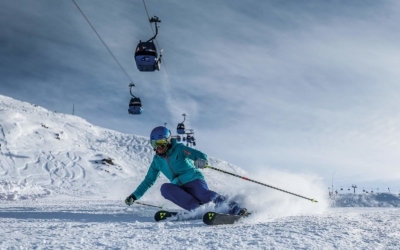 Adults can choose between full-day lessons and flexible individual lessons during their skiing holiday in Hochgurgl. 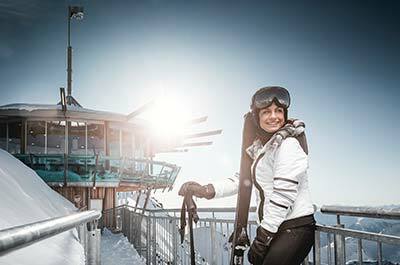 Relax before your skiing holiday starts – easy with 6 Scheiber sports shops in the Obergurgl-Hochgurgl ski area. They stock the season’s whole collection of skis and snowboards. Simply pre-order online and your kit will be waiting for you when you arrive at the TOP Hotel Hochgurgl. From helmet to ski boots and racing skis. If you prefer to browse for new holiday outfits and test your skis at your skiing holiday destination, sports consultants are available in selected shops until 9.30pm and 10.30pm during the ski season. The shop branches are located in prime locations adjacent to feeder lifts and offer TOP services including serviced ski depots. The TOP Mountain Crosspoint is an incomparable fusion of the world’s highest motorcycle museum (2,175m above sea level), a panoramic restaurant and terrace, indoor and outdoor chill zone, toll station, meeting point between the Hochgurgl ski resort and the Timmelsjoch High Alpine Road, lower terminus for the Kirchenkarbahn cable car and the passing point between North and South Tyrol. 6,060sqm of futuristic fun and relaxation. A magnet for fans of classic bikes, this unique collection of historic motorcycles never fails to impress. From A for AJS to Z for Zündapp, all the major motorcycle makes of the last 100 years are represented. A 3,000sqm area houses 270 classic bikes by around 110 manufacturers as well as rare cars. 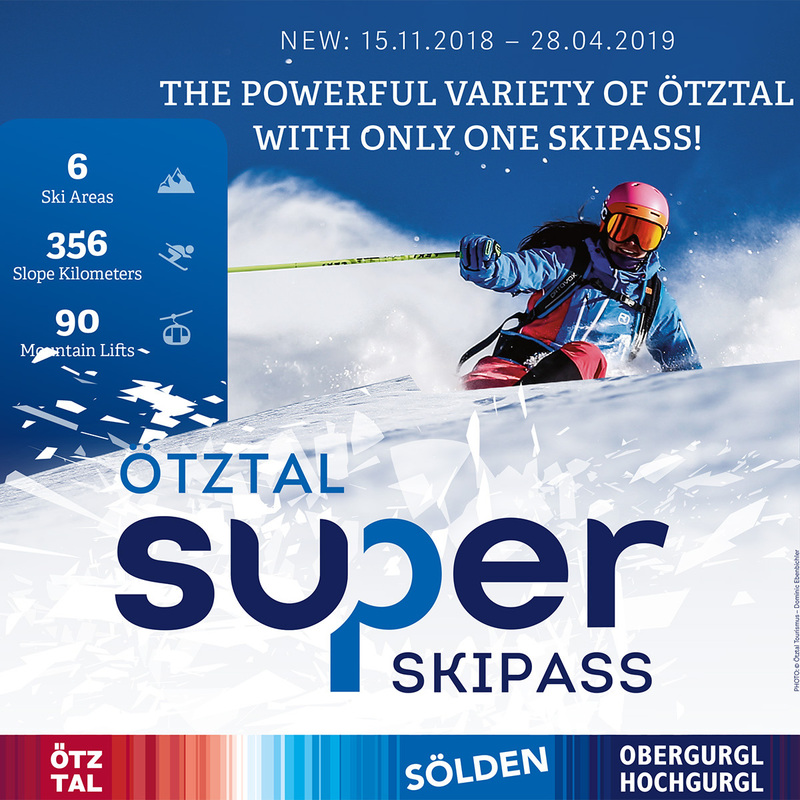 Be there as the Obergurgl-Hochgurgl ski area awakens. Make the first tracks in the freshly groomed slopes. 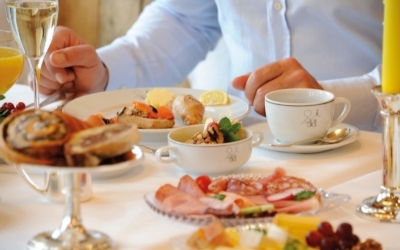 Greet the day on skis and then enjoy a first-class breakfast at the Hohe Mut Alm. First Line ensures exclusive fun on the pistes in the finest company (from 5 participants) on the Festkogl and Hohe Mut slopes and with your personal ski guide. Located at 2,150m above sea level in Hochgurgl at the head of the Tyrolean Ötztal Valley. 50km to Ötztal train station, 90km to Innsbruck airport, 290km to Munich airport, 290km to Zurich airport and 230km to Memmingen airport.